I grew up eating bulgogi (a.k.a. Korean BBQ or Korean Barbecue) on a regular basis. It was a mainstay at family dinners, picnics, community gatherings, and so on. Sometimes we would barbecue bulgogi using charcoal. Sometimes we would cook it on a stove top using a pan. And other times, we would eat it as a stew with a little bit of broth. No matter the situation or the method of preparation, it was always so delicious and satisfying. Admittedly, I don’t eat bulgogi nearly as much I used to. But I still enjoy it whenever I have it. I am also a little more health conscious than I used to be. So I no longer go on the carnivorous binges I used to. And I try to make healthier versions of my childhood dishes without sacrificing the taste. 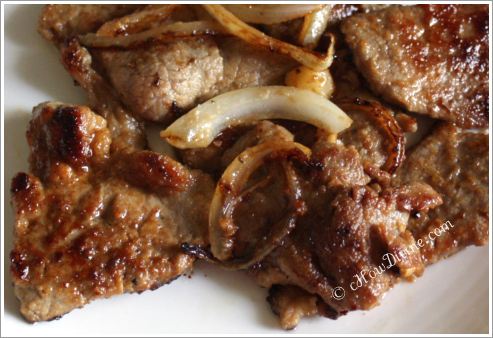 Bulgogi is usually made with very thinly-sliced rib eye steak. But I decided to make a healthier(not to mention much more economical) version of the dish by using grass-fed eye round steak. Eye round is a much leaner cut than rib eye. Rib eye comes from the underbelly, the site of the fattiest cuts. And the eye round comes from the back leg area, the site of the leanest cuts; however, eye round can be very tough because it has virtually no fat. But it works for this dish because the eye round is cut into very thin slices and also marinated. Just as insurance, I am also adding a kiwi to tenderize the meat. Raw kiwi is rich in actinidin, a protein-dissolving enzyme. Useful as it is, kiwis can make meat mushy. So you need to be careful when using it in a marinade. A little goes a long way (very quickly). I’ve been laid out by a cold for over a week. And I’ve been subsisting on soups to nurse my sore throat. 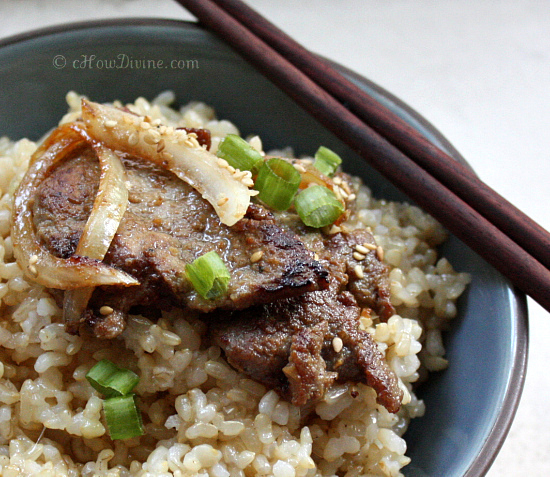 When I was finally ready to reintroduce some solids into my diet, bulgogi seemed like the perfect choice. I figured lean protein and the iron should do me some good while the flavor satisfies my taste buds. And it really hit the spot. I was so pleasantly surprised by the texture and the taste of this dish. It was healthy and tasted so very decadent. Note: Ask your butcher to slice the steak as thinly as possible. A butcher at Whole Foods Market was nice enough to pound the meat into thinner pieces when I told him the slices weren’t thin enough. Even so, the meat was slightly thicker than I would have liked. Surest bet would be to go to a Korean market where they do this as a course of business. Alternatively, partially freeze the meat and cut against the grain into very thin slices. 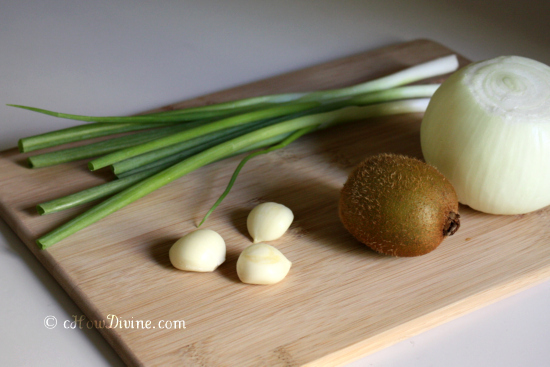 Place chopped onion and kiwi fruit in a food processor or blender and liquify. Pour into a bowl. 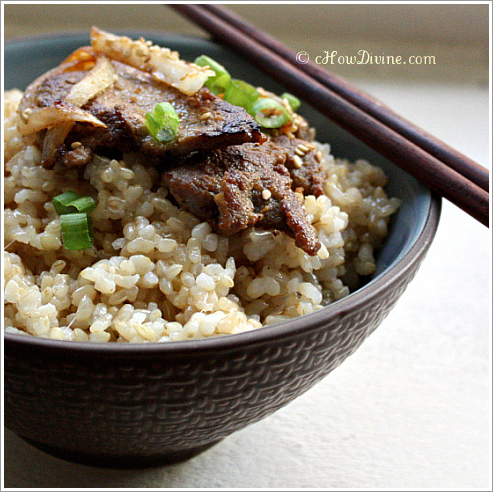 Stir in soy sauce, sesame oil, minced garlic, agave (or honey), sugar, mirin, and pepper. Mix well until the sugar is well dissolved. Place thinly-sliced beef into a large mixing bowl. Add prepared marinade from step 1, to the beef. Mix well while using your hands to massage the meat. Add sliced onion to the meat. Mix. Cover tightly. Marinate 30 minutes – 1 hour in the refrigerator. Heat a grill pan or a skillet on high heat. Add canola oil to coat the pan/skillet. Add marinated beef to the pan/skillet and cook until cooked through. Don’t overcrowd the pan/skillet. Overcrowding will result in lowering of the temperature of the cooking surface; this will result in boiling or steaming of the meat. On high heat, the meat should brown very quickly – within minutes. Garnish with chopped scallions and/or toasted sesame seeds if desired. Serve hot with rice. Pingback: I made f-ing kimchi! Green Cabbage and Onion Kimchi | I Ate That!